The High Pasture Cave excavations in Skye have been blessed with some pretty amazing weather conditions over the last couple of weeks; generally fine and dry, and with enough breeze to keep the midges at bay! The trenches however have proved to be dusty and the sediments quite dry, making excavation difficult at times. However, we have made some excellent progress on-site, while there has also been a steady stream of small finds from the trenches. 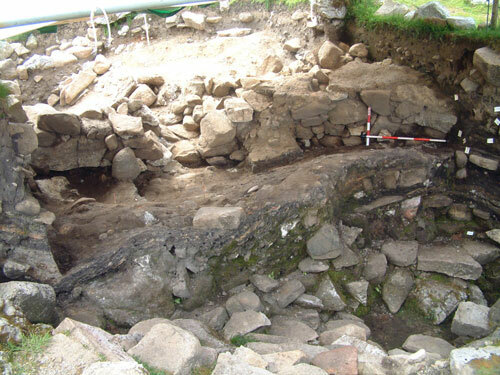 The main focus of the excavations so far have been in Trenches 14, 15 and 19. Unfortunately, we have been unable to start excavations in the cave so far due to the shortage of water for wet-sieving operations. The extension to Trench 14 is investigating the extent of the burnt mound and its relationship to a revetment wall that surrounds the cave entrance opened by cavers in 1972. 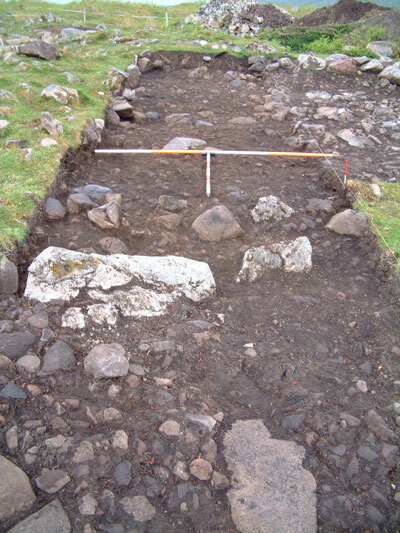 The trench will also allow the evaluation of a possible pit feature in this part of the site. The only small finds made so far in this trench are a single sherd of pottery and a pebble tool. However, this trench will reveal a nice section through this southern part of the site. 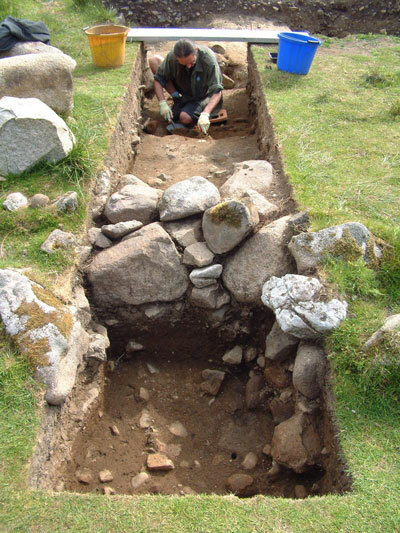 The section of wall has been removed from the trench today, so that we can see the overall relationship between contexts on each side of this feature. A compact layer of fire-cracked pebbles (burnt mound material) has now been uncovered and this will be investigated further during the course of this week. Over the course of the past two weeks, Martin Wildgoose has been investigating the thick layer of clay and associated ash layers immediately outside the stairwell entrance in Trench 15, and the removal of these layers has revealed additional courses of the substantial revetment wall that curves around the stairwell entrance. Subsidence within the deep ash and midden layers to the north of the wall has resulted in this feature leaning alarmingly in the direction of the stairwell. 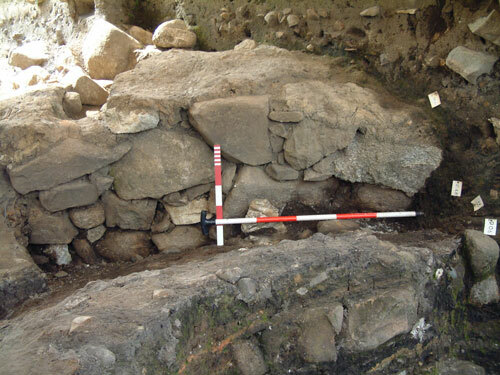 The only reason the wall has remained standing is due to the archaeological layers abutting it; and now we have removed these layers, the feature is prone to collapse. From our excavations so far on the wall it appears that the thick layer of clay abutted the north face of the wall, while the lower ash layers run below it. Therefore, we have decided to remove the eastern end of the wall on our section line through the ash layers, so we can reveal the relationship between this feature and the associated stratigraphy. The east end of the wall facing the stairwell entrance (Scales=1m and 0.5m). This end of the wall will be removed; although we have to somehow move the large limestone block! 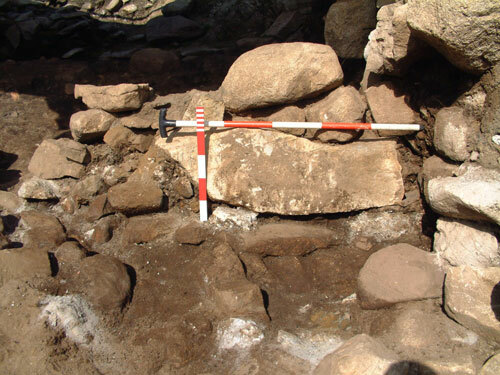 The image below shows the back, or south side of the revetment wall at the eastern end after removal of the wedge of backing stones. The opposite side of the large limestone block can be seen in the wall. 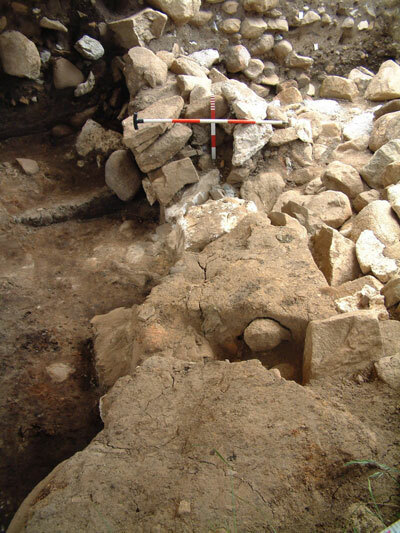 No small finds have been recovered during the dismantling of this section of wall, although a few fragments of charcoal, fire-cracked pebble and degraded bone have been found. Trench 19 is one of our largest trenches opened at the High Pastures site, which was located to investigate the morphology of the burnt mound/spreads in this part of the site and to hopefully reveal the cause of an anomaly picked up during geophysical survey (resistivity). The anomaly indicated the possible presence of a built structure, or area of paving, within the burnt mound. In the northern sector of Trench 19, adjacent to the possible main entrance into the site, Charles Burney has been excavating a feature within the spreads of fire-cracked stone and the granite and limestone boulders that overlie this area. 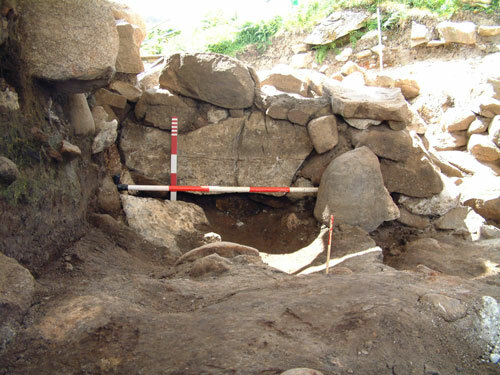 Unfortunately, no finds have yet been recovered from the feature, which comprises an oval stone-built cell. 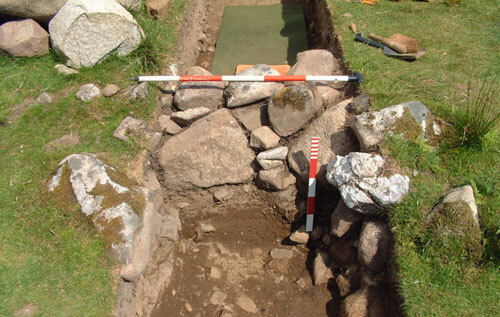 The trench has cut through the feature, so we will extend this area to include the remainder of the structure and what was possibly the main entrance accessing the High Pastures site during the Iron Age. During the past couple of weeks Trench 19 has provided the focus of excavations on site, especially for the volunteers who have joined us during this period. 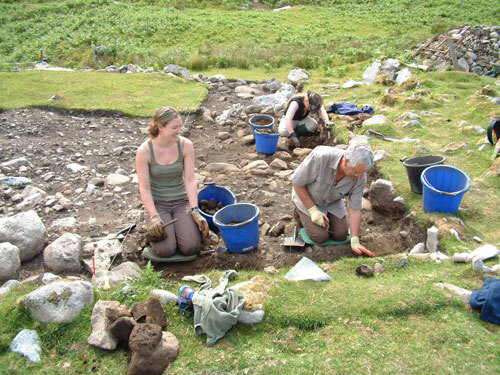 The image below shows Jessica Whelan and John Hayward, with Duncan Aitken beyond, excavating the upper burnt mound deposits in Trench 19. 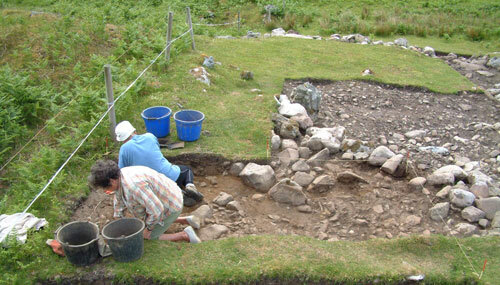 Kath Small and Marlene Sayers from Ballachulish also joined us on site and the image below also shows them excavating the burnt mound deposits in Trench 19. Kath and Marlene are regular volunteers on site. This is also the third year that Duncan Aitken has joined us at High Pastures. 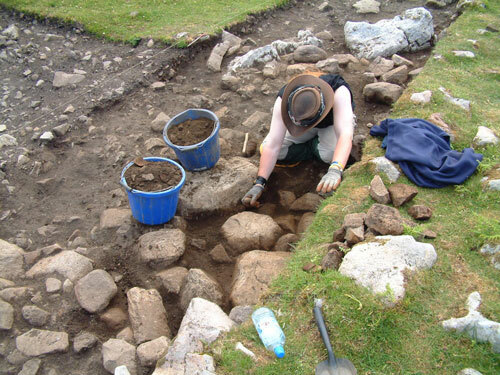 During previous visits Duncan has had one or two minor finds from the trenches he has worked in. However, this year, during his two weeks on site, Duncan has made two wonderful finds - including half of a blue glass bead with white inclusions from Trench 19 and a part-finished polished stone axe from a pit feature in the east sector of the site. 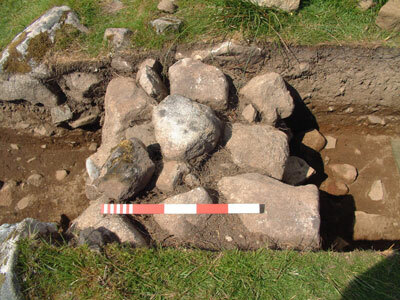 For further details of these finds, including images, see the Latest Finds Page. Thanks again for the tour of this fantastic site-last week-sorry missed metal smelting-hope to visit again and will follow your progress.